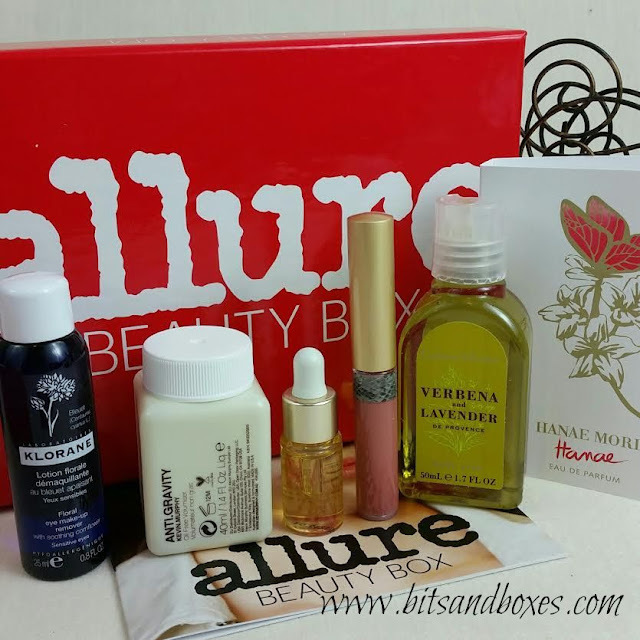 Allure is doing such a fantastic job with their beauty box! I think it's probably better now than it ever has been and I'm really happy about it. I mean, Birchbox is fun and all that, don't get me wrong. When it comes to quality brands and excellent skincare, however, Allure is where it's at. I consistently find that this box is worth what I pay for it and it's on my Top Ten list for a reason. 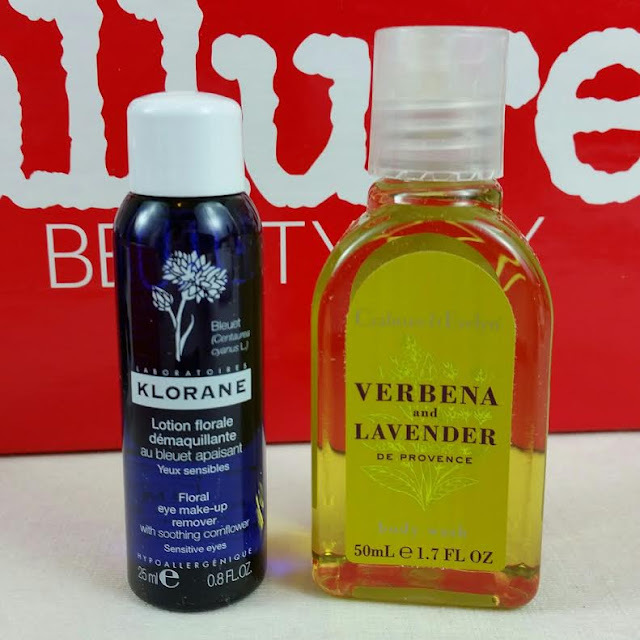 Klorane Floral Eye Make-Up Remover- For some reason that I can't remember, I tossed my bottle of eye makeup remover. When I needed it (because that Jouer Kitten Liner is AMAZING but it sticks like glue!) and didn't have any, I wasn't happy I had done that. Now, though, I have something new to try! This is a watery, pale blue liquid and it smells sort of flowery but sort of herby at the same time. Not bad and it's not like it stays around so no big deal. This is a good size for me, too, because I really don't go through this stuff very quickly. Crabtree and Evelyn Verbena and Lavender Bath Oil- I'm a little sad that it has lavender in it so I can't use it but it will be a good stocking stuffer. It's apparently very highly scented so I haven't even opened it (yay, allergies!) but the booklet says it's strong and citrusy in a good way. I like Crabtree and Evelyn; I'm always happy to see them in a box. Kevin Murphy Anti-Gravity Oil Free Volumizer- I know I'll never get away from hair products in my boxes no matter how much I don't use them. This is an insanely cute little bottle but I bet it's hard to get the product out. This is a serum that boosts volume without weighing it down. Don't they all say that?! Haha! It's supposed to be good for wavy-haired folks who want a sleek, straight look. 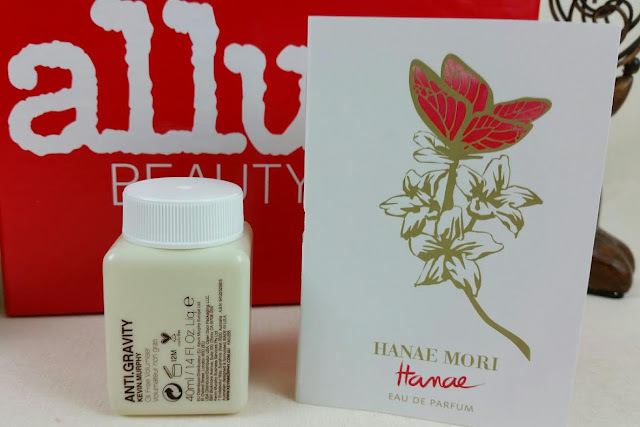 Hanae by Hanae Mori- I have no idea who Hanae Mori is so please excuse my ignorance. I'm not big on perfumes, at least random ones and especially not ones with patchouli. That's unfortunate because otherwise this sounds amazing with sandalwood and jasmine. Patchouli makes my nose itch. 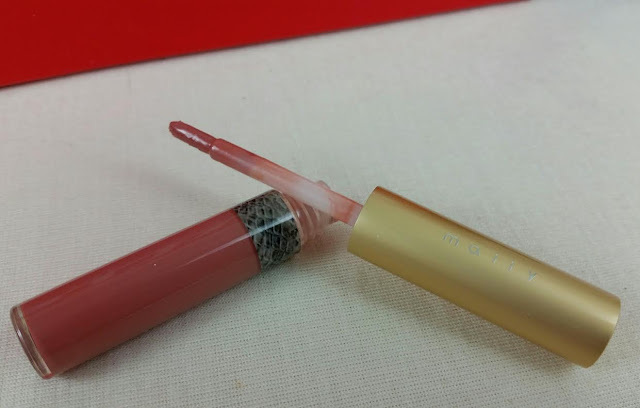 Mally Beauty High-Shine Liquid Lipstick in Perfect Pink- Give me all the lip gloss!! All the time!! I'm a sucker for lip glosses, lipsticks and tinted lip balms! My lips are boring colored naturally and tend toward chapping so I'm always looking for the perfect moisturizing shade of lippie (I hate that word but it seems to be the only one that covers all kinds of lip products). Right now I'm still in love with the Too Faced Lipstick we got in the Box of Style. I received Perfect Pink but there are a total of ten shades available. It's definitely high shine, it's sticky and it's also super sheer. Perfect Pink is just a little bit darker than my natural lip color and I can see using this over another lipstick but not plain. The brush is exceedingly stiff even though I tried to coax it into being more brushlike and less like a stick. 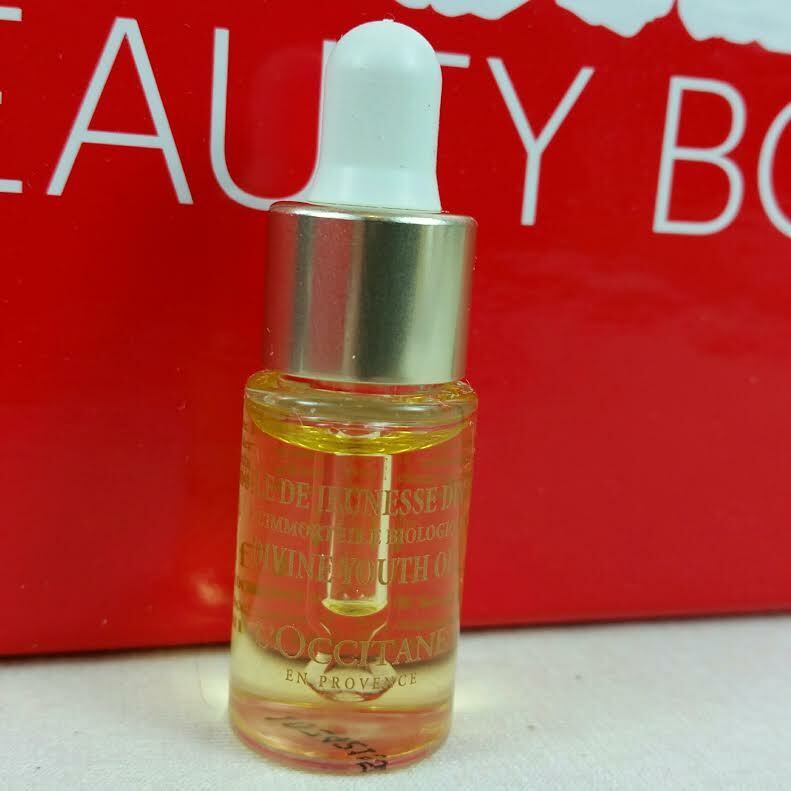 L'Occitane Divine Youth Oil- This is my favorite (and the most expensive) item in the box. This is one of the reasons I love the Allure Beauty Box over Birchbox and Ipsy. The brands! This is a facial oil perfect for the winter months. It uses sunflower, apricot, evening primrose and seabuckthorn oils to moisturize and rosehip oil for a powerful antioxidant punch. I know it's hard to imagine putting an oil on your face but even oily skin needs to be hydrated and this is an excellent way to do it. Sunflower oil and evening primrose oil are occlusive which means they help form a barrier over your skin to keep in the moisture. Seabuckthorn oil is perfect for oily skin and makes this Youth oil lighter. Here's how I use oils like this (keep in mind I have dry skin). Because most of these oils are occlusive, it means that I need them to trap as much moisture under it's barrier as I can. So I apply all my moisturizers and put this on top of them all. So everything I've used to moisten my skin and keep it hydrated, stays in my skin and is not depleted by the air. The oil protects my skin from the outside environment. I typically use oils at night. Mainly because they can make my face shiny and because I feel like I might dilute my SPF (which I haven't done any research about so it's really just my personal preference). If I'm feeling really dry, I might forego my makeup for a day and just slather that oil on. It does make a difference. TL;DR- yeah, oils. Try them! VERDICT: I've been subscribed to this box for almost two years and still enjoy them every month. I love getting good quality skincare, I love the brands, the variety and the price. I do think this box is skincare heavy and geared toward women who are concerned with their skin. It's obviously not all skincare, this month is an excellent example of wide variety of products that can be included, but there's a definite skew towards skincare. What do you think of the Allure Beauty Box? I know not all boxes are for everyone so I'm always curious about other opinions.